You probably have never had a dentist or even a medical doctor talk to you about nutrition like I am going to do. You see, nutrition is at the core of everything your body does for you. From health to sickness, from energy to lethargy, from happiness to depression – the necessary nutrients your cells receive or do not receive affect everything about you. If only one cell in your body is deprived, it slowly affects the rest of you. Therefore, by making improvements on a cellular level, you will eventually make improvements in your dental and gum health along with your overall health and well-being. It all starts with you making a decision to change your lifestyle in order to change your health. To make a life-change, some people need a personal tipping point like a stroke or a heart attack. Some people need a love-of-their-life like the birth of a child, or getting married, or even beginning a new job before making a change. Some people only need information that they never knew existed. Which person are you? To start, you may want to read the PDF of the Questionnaire and the PDF of the 3-Day Food Journal to understand what information I am looking for. Your responses will give me a picture of your current health and lifestyle, which affect your mouth and body. 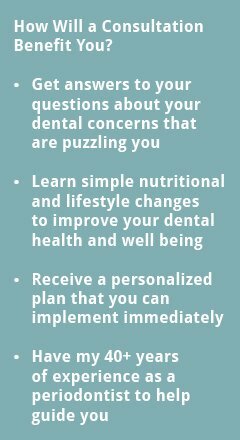 Once you schedule a consultation, you could submit your responses online (Online Questionnaire Responses and Online 3-Day Food Journal Responses). After the initial consultation, you can schedule additional consultations online as you see fit. If necessary, I will recommend you schedule appointments with various health professionals in your location. I look forward to working with you and helping you on your path to good health.